Most women dream of having a flat, toned stomach but sadly, it's something that takes a good deal of effort and determination to achieve. Eating the right kind of foods and doing the most effective type of exercise is the best way to go about getting an enviable flat stomach but be warned, it won't happen overnight. To lose weight, you need to be consuming fewer calories than you're burning off. Exercise can definitely help to burn calories but you need to eat the right type of foods too. Some low-calorie foods are thought to encourage your body to burn more calories than you're consuming so that you're actually losing weight rather than gaining it. 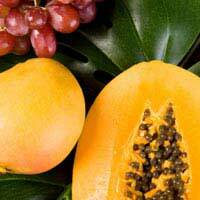 These foods include grapefruit, mango, papaya, watermelon, blueberries, celery, asparagus, spinach and cucumber. Veering towards “good” foods: Foods that are considered “good” to eat when you're trying to get a more toned stomach include lean meat, fish, poultry, eggs, fruit, vegetables, whole grains (which can alters the glucose and insulin levels in your body, which can have a knock-on effect in terms of burning fat, particularly the deep layers of fat underneath the skin) and even dark chocolate (which contains monounsaturated fatty acids, which are believed to burn abdominal fat). Avoiding “bad” foods: You probably know that fatty foods are best avoided if you're looking to lose weight, especially “trans” fats that are found in foods like biscuits and margarine and are thought to encourage fat to accumulate around the abdomen. Needless to say, staying well away from these is a must if you're looking to get a flat stomach! Drinking more water: Drinking the recommended eight glasses of water per day helps to flush out toxins but it can also be good for aiding weight loss. Water is important for maintaining efficient kidney function, which in turns affects the ability of the liver to burn fat. It is also a natural appetite suppressant. If you don't drink enough water, your body hoards what little water there is, which can lead to bloating and water retention. If you then decide to up your water intake, this bloating should disappear as the body recognises that it's no longer so important to keep hold of it. Contrary to popular opinion, doing sit-ups and stomach crunches to “spot burn” fat isn't the best way to get a flat stomach. Many people mistakenly believe that they can burn fat in a specific part of the body (like the stomach or the thighs) through stretches that specifically target this area. However, if the abdominal muscles are currently covered by layers of fat, these kind of exercises won't produce a toned stomach. Instead, you need to do exercise that will help to reduce stomach fat and “expose” the abdominal muscles underneath. Aerobic exercise such as walking, cycling, swimming, jogging and aerobics is one of the best means of getting a flat stomach through exercise. This type of exercise burns more calories and encourages fat to be lost throughout the body so it's good for all-round toning but fat is usually lost from your stomach first. Once you've started to lose fat from your stomach, targeting the stomach muscles through crunches and sit-ups will be of greater benefit and it should be easier to tone the abdominal muscles this way.